Oh yes it has. It’s been almost a month since I posted about new books. That’s a long time. Yes, it is. Bet you’re dying to know what I got, right? I bought this for 30p at my library. Would have been rude to resist. Taft by Ann Patchett – I love her novels. Since I read Bel Canto many years ago, I’ve been a huge fan and have also read The Magician’s Assistant and The Patron Saint of Liars. Her writing just speaks to me. Memories of a Catholic Girlhood by Mary McCarthy – an autobiographical account of her early life by the author of The Group (which I still haven’t read but really want to). The Woman in Black by Susan Hill – finally. I was in two mind about whether to read this first or go and watch the play but I’ve decided that I’d like to scare myself reading as it doesn’t happen often (considering I read a lot of vampire/gothic/supernatural books). Literary Theory: A Very Short Introduction by Jonathan Culler – because I felt it’s time I ingested a bit of lit theory. I wonder whether it will improve my posts. Murder in the Dispensary by Jolyon Carr – Ellis Peters’ first novel! And a mystery! You can’t blame me. On the Beach by Nevil Shute – for my book group. I had to get this one. And I loved it! Freedom by Jonathan Franzen – I was going to wait for the paperback but the Franzen frenzy got to me. Plus it’s the wrong verson. But who cares? I enjoyed The Corrections when it first came out and thought it was immensely readable so I’m looking forward to reading this. Sacred Hearts by Sarah Dunant – from Becca aka Oxford Reader at the UK Book Bloggers’ book swap. I haven’t read any books by Dunant so looking forward to this. Being Wrong: Adventures in the Margin of Error by Kathryn Schulz – from Portobello Books on Twitter. It’s something I struggle with all the time so it would be great to get an insight on our fear of being wrong. The Triumph of Caesar by Steven Saylor – the 12th book in the Roma Sub Roma mysteries featuring Giordianus the Finder. Great stuff and you learn a lot about the Roman Empire. Vicky Had One Eye Open by Darryl Samaraweera – an impulse get by a Sri Lankan author. I haven’t heard of this one but I have a penchant for anything Sri Lankan. Pretty Monsters by Kelly Link – I’ve heard lots of good things about this one and hear Neil Gaiman is a fan. Nuff said. The Monsters of Templeton by Lauren Groff – this seems like a suitably gothic read. Obviously I’ve got monsters on my mind. Jasmyn by Alex Bell – I loved Bell’s first book The Ninth Circle which I read last month and am really looking forward to reading this one! Well, looks like I really went overboard. I must have needed a lot of de-stressing. Now all I need to do is clear my schedule for some intense reading time. If only. I too, love Ann Patchett but lately have come across a few who don’t seem to love her. To the point where I started to question my own assessment. Now that you post this I realize that my assessment of her is probably right on. Having said that, Taft was my least favorite. I want to read both Taft and Freedom. Great books! Lots of fun books there! Happy reading. Ahhhh, lovely books! Some great looking books in that pile – enjoy! I’m reading The Corrections now together with Revolutionary Road, which I think I’d finish first. The Corrections seems to take much more careful reading, although I found the two to have some similarities. I look forward to your review of Freedom. Also,the past weekend I saw, long awaited, the film adaptation of Never Let Me Go, a good rendition of the book I think. I haven’t read ‘Revolutionary Road’ although my father said it was really good. But I’ve heard it’s very depressing so may have to wait until I’m in a suitable mood. I’m looking forward to seeing ‘Never Let Me Go’, although the book wasn’t my favourite by Ishiguro. But he’s one of my favourite writers too. That is such a great haul! I especially like the sound of the two books you got at the UK blogger meetup! I studied in a convent so I would like the Catholic childhood part of the book. Sacred Hearts ditto (I read it and liked it very much). The Samaraweera is completely new to me. Maybe not published in Sri Lanka but I will look for this author – thanks for the tip. Am in Melbourne so back to op shop heaven!!! I read Woman in Black did not like it but felt that I must go back to Susan Hill which I did and I really liked the next book I read by her! You have such an interesting pile there. Enjoy the reading. Enjoy Jasmyn, in my opinion it’s just as good as TNC. There’s been quite a bit of talk about On The Beach recently and it sounds interesting so I look forward to your review! My review’s already up:) Really looking forward to reading ‘Jasmyn! Thank you everyone for your comments! 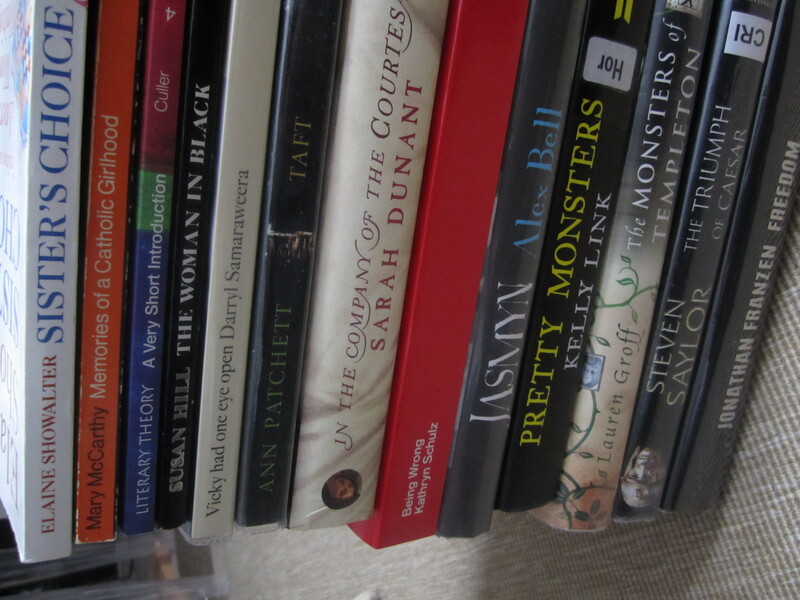 I always feel self-indulgent writing lists of books I bought, but can’t help it! Also, I love reading about other people’s hauls too! I’ve only read one Ann Patchett novel, Run, and I liked it and hope to read more of her work at some point. Enjoy all your new books! I love Steven Saylor’s books! I’ve read all the “Finder” books and “Roma”. I have “Empire”, which picks up where “Roma” left off, sitting on my shelf waiting. I also enjoyed the Sarah Dunant book you have pictured. Anna: I haven’t read ‘Run’ yet, but hope to do so sometime. Mae: We’ll see about the film, although I suspect it will be scarier than the book. Kelly: I love his books too! I haven’t read his ‘Roma’ books yet though.